UNKNOWN -CARTA PARA LA INTELIGENCIA DE LOS ESTABLECIMIENTOS DE LOS PORTUGUESES Y HOLANDESES EN LAS INDIAS ORIENTALES. UNKNOWN - CARTA PARA LA INTELIGENCIA DE LOS ESTABLECIMIENTOS DE LOS PORTUGUESES Y HOLANDESES EN LAS INDIAS ORIENTALES. Title : CARTA PARA LA INTELIGENCIA DE LOS ESTABLECIMIENTOS DE LOS PORTUGUESES Y HOLANDESES EN LAS INDIAS ORIENTALES.. Size : 10.4 x 18.9 inches. / 26.5 x 48.0 cm. 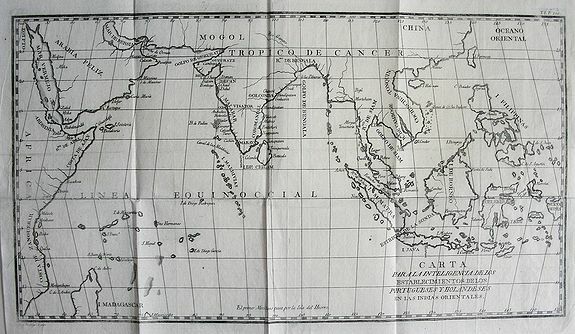 Description :SCARCE map of the Indian Ocean and South East Asia. Extends from the East African Coast, Madagascar, and Arabia to Formosa (Taiwan), the Philippines, and New Guinea. Faint and hard to read imprint in the bottom left corner reads "Juan Redriguez" or similar. A very unusual map, we could not find any example in auction records or online library listings! Condition : Very good impression. With two real watermarks visible when held against the light. Clean and bright, hardly any spotting or toning. Horizontal and vertical folds with some light rubbing. Several additional creases.